As one of Europe’s most attractive regions, the Languedoc-Roussillon offers an incredible natural diversity and a rich historical heritage, plus splendid architectural and cultural variety. With wine, sunshine and history in abundance, it is clear why this quintessentially French region, widely known as simply Languedoc, is proving to be a popular choice for property hunters looking to buy a holiday home in the South of France. The exceptional region is bounded by the region of Auvergne to the north, Provence-Alpes-Côte d’Azur to the east, the Mediterranean Sea to the southeast, Spain to the south, and the Midi-Pyrénées to the west. Property in Languedoc attracts many French investors from the North, as well as buyers from across Europe – particularly the UK, Scandinavia, Belgium, the Netherlands and Switzerland – and from the Middle East, China, South Africa and the United States. With so many charming attributes, it is not surprising that the number of property buyers continues to grow. The region offers home hunters everything they could want from a destination – sunny climate, unspoilt countryside, a stunning Mediterranean coastline, fabulous wide sandy beaches, scenic mountains, some of France’s prettiest villages, elegant cities, superb food, exciting wines, and some of the country’s most spectacular historical sites. One of the most scenic regions in the world, Languedoc boasts a rich variety of landscapes. Savour the rolling hills bathed in vineyards and the garrigue, which is composed of broom, rosemary, lavender, euphorbia and other dry-weather plants. Take in the olive groves, the Mediterranean oak, the platins or plane trees, the almond and cherry. Farther north in the hills one finds huge forests of pine. Discover the valleys and the snow-topped Pyrénées. Languedoc is well known by cycling, walking and hiking enthusiasts, by mountain bikers, pony trekkers and horseback riders. They adore its varied landscapes. There are over 7,000 kilometres of footpaths, bridleways and trails that cut across scrubland and woodland, through plateaus and plains, into gorges and up mountainsides. The spectacular coastline of Languedoc stretches for 220 kilometres along the Mediterranean Sea, and is graced by some of the finest French beaches, turquoise-blue water, saltwater lagoons, pretty coastal towns, ancient fishing villages and modern beach resorts offering every kind of aquatic sport, from waterskiing, sailing, windsurfing, funboarding, scuba diving, sand yachting, kite-flying and sea kayaking, to jet-skiing. Golfers adore the scenery and the fantastic weather that permeates Languedoc. With 14 courses throughout the region – including high-altitude courses such as Font-Romeu and Lamalou-les-Bains, plus several coastal courses – Languedoc is great for golf holidays abroad. The area is also great for fishing, bird watching, mountain cycling, rambling and skiing in the Pyrénées come winter. The region is blessed with historical monuments, abbeys and castles. It boasts six UNESCO World Heritage sites – the Pont du Gard, the Canal du Midi, the medieval city of Carcassonne and the pilgrimage routes to Santiago de Compostela, the Mediterranean agro-pastoral Cultural Landscape of Causses and the Cévennes, and the Fortifications of Vauban. As a land of Mediterranean culture, Languedoc is characterised by its ‘art de vivre’ (‘art of living’) and it remains staunchly married to its traditions and customs. There are plenty of festivals and carnivals. Amongst them are the celebrations of the bull in the Camargue marshes, the fishermen’s festivals at Gruissan, Sète and Bouzigues, and the maritime jousting matches at Sète and Mèze. Montpellier, the capital of the region, is officially the favourite city of the French in which to live. As one of the most beautiful in France, it is where the pace of life is unhurried and the quality of life is superb. Historic buildings meld comfortably with the latest in modern architecture. With its exceptional heritage, Nîmes boasts world-class Roman monuments, as well as an attractive old town and wonderful gardens. Carcassonne and Narbonne are small canal-side cities, whilst Perpignan, the most Spanish of France’s cities, is alive with Catalan flair, tapas and a thriving art scene. Pretty villages include Minerve, Lagrasse, Roquebrun, Olargues, Collioure and Saint-Guilhem-le-Désert. Historic towns such as Pézenas, Uzès, Sommières and Limoux all offer interesting architecture and plenty of lovely shops and restaurants. Undoubtedly the most beautiful canal in Europe, the Canal du Midi is considered a masterpiece of French engineering, linking Toulouse to the Mediterranean via a waterway that extends for 240 kilometres. Cruising gently on a boat through the Languedoc countryside is one of the most delightful ways to explore the region. Not surprisingly, locally produced food and wine are abundant in Languedoc. The traditional cuisine is centred on olive oil, garlic and basil, and is often flavoured with the herbs of the garrigue, including thyme, rosemary, bay and savory. Fresh fish and shellfish are caught daily, whilst cheese, wine, honey and fruit top off the rural and coastal specialities. The vineyards of Languedoc are some of the oldest and largest in the world, and produce some of the most renowned French wines. The region produces more than one-third of the nation’s wine and over the past 15 years, it has undergone a revolution that has seen a vast improvement of quality and variety. The area is now considered one of the most exciting wine producing regions anywhere. Languedoc is expected to be the next important area for French Grand Cru. The region’s combination of varied terrain and climate, the variety of grape types produced on old vines, the modern hybrids, the diverse styles, philosophies and techniques based on open-minded, independent thought, come together in a perfect match. Passionate wine makers from South Africa, Australia, the UK, America and other parts of France are converging on the region, experimenting fearlessly in an attempt to produce the best wines possible. This spirit is infectious and more and more, the world’s fine wine minds are drawn here. Together, they are producing old world-style wines with that new world approach. The result, so far, has been an explosion of Languedoc wines on the lists of top-rated restaurants the world over. The Languedoc region sports five international airports (Carcassonne, Montpellier, Béziers, Nîmes and Perpignan), and another five lie just beyond its borders. France’s impressive TGV trains can be found all over the region, whilst the A9, A62 and A75 motorways also provide easy access in and out of the area. For those in search of property in La Belle France, the "real" France, Languedoc could be just what they are searching for. Languedoc real estate offers enough choice to suit everyone’s Mediterranean dream home. 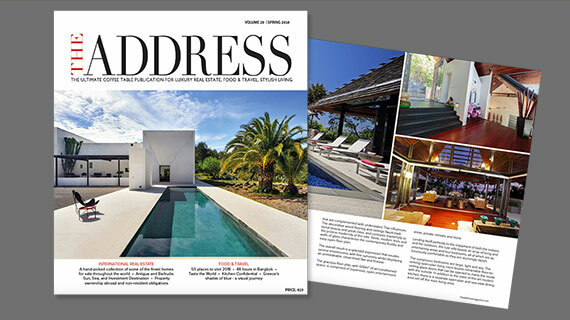 Read more about Languedoc properties for sale in THE ADDRESS Magazine.